Your one stop for ALL of your garage door needs! 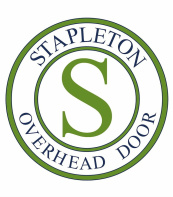 Stapleton Overhead Door is a Eugene based, locally owned and operated business specializing in the service, sales and installation of both residential and commercial garage doors and garage door openers. We offer troubleshooting and repair of all your garage door and/or garage door opener and opener accessories. Residential and commercial....all makes and models. We also offer 24 hour emergency service. "Excellent workmanship, reliability, customer service and rates! Look no further, this is the place to go when you need to get it done."